Career options for our human resource management graduates reach into every segment of the world economy. In our program, you'll keep pace with the dynamic world of business and use a state-of-the art building and labs to explore human resource functions such as recruitment, staffing, training and development, performance, management, work environment and change management, compensation, benefits, labor relations and employee safety and health. You'll also find an opportunity for an unparalleled international experience that will help you discover new ways of doing business. 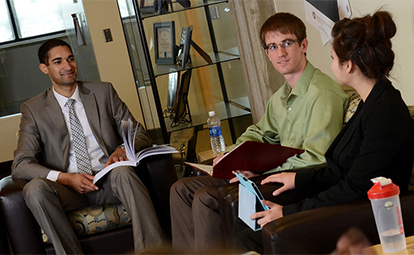 Human resource management majors complete Herberger Business School's core program of accounting, economics, mathematics, communication, law, ethics and financial principles. Students gain skill sets in recruitment and staffing, employee development, total reward systems and labor relations. Students network with business leaders through the Central Minnesota Society for Human Resource Management (CMSHRM), and the Twin Cities Human Resource Association (TCHRA). Participation in the SHRM Student Case Competition and Career Summit, Minnesota State SHRM conference and applied learning activities prepare students for the profession. The human resources program prepares students to take SHRM's Assurance of Learning assessment for graduates of HR degree programs. The Human Resource program was one of the first in the United States to be confirmed through the academic initiative of the Society for Human Resource Management (SHRM) as being aligned with SHRM's guidebook and templates for human resources curriculum. St. Cloud State's SHRM student chapter consistently receives the Superior Merit Award or Outstanding Merit Award from the national SHRM organization. Notable alumna: Akash Sen '03, MBA, is talent director at Saatchi & Saatchi, a global advertising agency with offices in 76 nations.